"To speak of comparative and international law in the United States in the last century is to speak of Rudi Schlesinger ," says Faust Rossi, J.D. 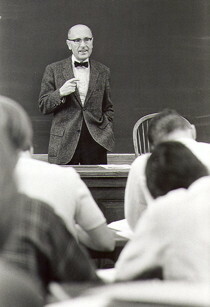 '60, the Samuel S. Leibowitz Professor of Trial Techniques at Cornell Law School and a former pupil of Schlesinger. "He made comparative law a 'real' subject for law schools everywhere." In 1950 Schlesinger published "Comparative Law: Cases, Texts, Materials," the first casebook on comparative law in the United States. The book, now in its seventh edition, remains a staple of law school curricula. His groundbreaking studies of comparative law helped Cornell Law School to gain an international reputation for excellence. He also taught contracts, torts, civil procedure and corporations. He retired in 1975. "True greatness of a law school can stem only from dedication to inspired teaching – the kind of teaching that requires a prodigious portion of the teacher's strength and enthusiasm and will leave only a moderate amount of time and energy for the other temptations; the kind of teaching that not only sharpens the students' legal minds but affects them as human beings, the kind of teaching that will continue to weave a bond of loyalty among all members of the law school family, and which, a hundred years from now, will bring to these halls another group of distinguished and faithful alumni, united by fond memories of intensive learning and by a shared affection for their alma mater." Died in November 1996 at age 87, along with his wife, Ruth, a retired arts curator at Hastings. The couple is believed to have taken their own lives because of Mrs. Schlesinger's failing health. Estévan Antonio Fuertes' legacy at Cornell could be said to span water, earth, air and the heavens. Recruited in 1873 by President A.D. White to head a fledgling civil engineering department, Fuertes served Cornell for 29 years – establishing the College of Civil Engineering (later the School of Civil and Environmental Engineering); a weather station (subsequently taken over by the U.S. 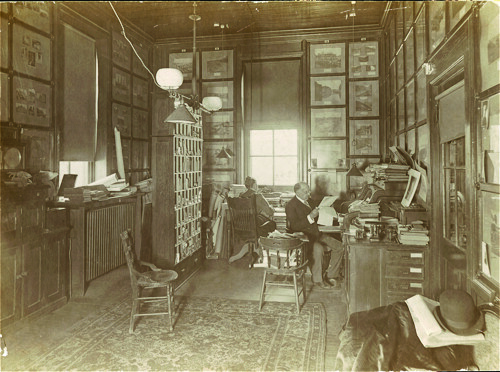 Weather Bureau); a hydraulic laboratory; and the Fuertes Observatory overlooking Beebe Lake. Fuertes advocated for laboratory learning. He acquired instruments and stimulated infrastructure developments in a period characterized by "… lack of room, lack of equipment, lack of assistants … ," according to Henry Neely Ogden, a student-turned-professor and accomplished civil engineer. By the time he retired due to ill health, the department's original 14 technical courses had been tripled, Cornell boasted the nation's leading civil engineering faculty, and laboratory research was integrated into coursework. "Dr. Fuertes was a visionary who was able to see back then the value of an education that has both theoretical and practical elements of the highest quality," says Lance Collins, the Joseph Silbert Dean of Engineering. "Indeed, this aspect of the Cornell education remains true to this very day." His work also lives on through the Fuertes Medals, which he established through a gift of $1,000 in 1893. They are awarded annually to outstanding civil engineering graduates. "Professor Fuertes' legacy at Cornell – coupled with his generous award – has influenced me to strive my hardest in all that I do," says Michael Muller '12, the most recent student to receive the medal. Educated at Conciliar College of San Ildefonso in Salamanca, Spain, and the Rensselaer Polytechnic Institute in Troy, N.Y.